The fourth week of gestation is characterized by the flexion of the superior portion of the neural tube to create the mesencephalon. 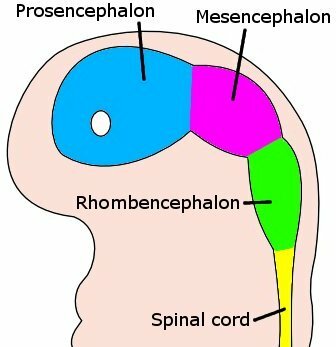 Neural tube flexion patterns determine neural development, including the positioning and differentiation of the prosencephalon and rhombencephalon, as well as the optical vesicle. Important changes occur to the embryonic heart as well, including development of the pharyngeal arches. At the end of the fourth week, the yolk sac presents the appearance of a small pear-shaped vesicle (the umbilical vesicle) that opens into the digestive tube by a long, narrow tube—the vitelline duct. mesencephalon: A part of the brain located rostral to the pons and caudal to the thalamus and the basal ganglia, composed of the tectum (dorsal portion) and the tegmentum (ventral portion). mandibular arch: The first pharyngeal arch, also called the mandibular arch, is the first of six aortic arches that develops in fetal life during the fourth week of development. optical vesicle: The eyes begin to develop as a pair of diverticula from the lateral aspects of the forebrain. These diverticula make their appearance before the closure of the anterior end of the neural tube; after the closure of the tube they are known as the optic vesicles. Trophoblast cells surrounding the embryonic cells proliferate and invade deeper into the uterine lining. They will eventually form the placenta and embryonic membranes. At the end of the fourth week the yolk sac presents the appearance of a small pear-shaped vesicle (the umbilical vesicle) opening into the digestive tube by a long narrow tube, the vitelline duct. The chorion undergoes rapid proliferation and forms numerous processes. The chorionic villi, which invade and destroy the uterine decidua and at the same time absorb from it nutritive materials for the growth of the embryo. Until about the end of the second month of pregnancy the villi cover the entire chorion, and are almost uniform in size, but after this they develop unequally. Late in the fourth week of gestation, the superior part of the neural tube flexes at the level of the future midbrain, the mesencephalon. Superior to the mesencephalon is the prosencephalon (future forebrain) and inferior to it is the rhombencephalon (future hindbrain). The optical vesicle (which will eventually become the optic nerve, retina, and iris) forms at the basal plate of the prosencephalon. Embryo brain at four weeks: At four weeks the embryo’s brain can be differentiated into the proscephalon, mesencephalon, and rhombencephalon. A white circle represents the area of the optical vesicle. The embryonic heart attains functionality and starts beating at 22 days after conception (about five weeks after the last menstrual period). It can sometimes be seen as flickering in the embryonic chest by an ultrasound performed during the fourth week after conception. During the fourth week of development, the first pharyngeal arch, also called the mandibular arch, is the first of six pharyngeal arches that begins to develop. It is located between the stomodeum and the first pharyngeal groove. 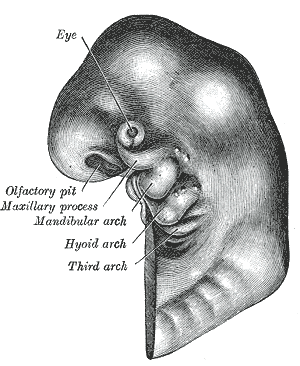 Developing fetus: A schematic of a developing fetus with the first, second, and third arches labeled.